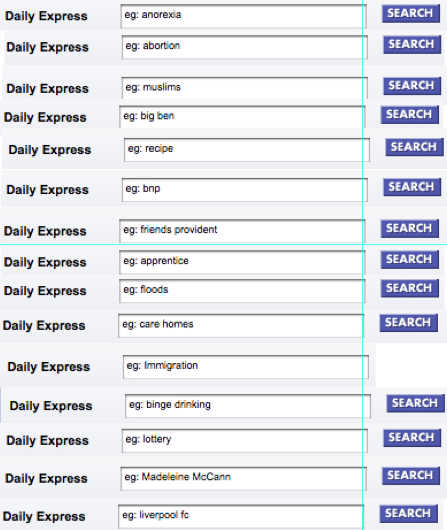 Do Daily Express search suggestions reveal editorial agenda? Which comes first? A newspaper’s agenda or its readers’ interest in those subjects? The search suggestions at Express.co.uk give a revealing insight into either what its readers are searching for or what the Express wants them to be interested in. The 15 examples shown here are: anorexia, abortion, muslims, big ben, recipe, bnp, friends provident, apprentice, floods, care homes, immigration, binge drinking, lottery, Madeleine McCann, Liverpool FC. But there are many more to be found by reloading the search page (none of them terribly cheerful). For more on search at the Express, check out this analysis of its top-10 searches box, revealing an ongoing obsession with the McCanns. This entry was posted in newspapers, online journalism, SEO and tagged daily express, Express, search, search box on March 19, 2009 by Paul Bradshaw. No mention of Diana? I am surprised! John – I’m sure if you press refresh some more times, she’ll come round eventually (that isn’t a complete list above).